What this means is that for the cities where the new data will be available, geo-referenced models that had been created by users and uploaded to the 3D Warehouse, will not be shown in Google Earth anymore. They will remain available in the 3D Warehouse (and any future version of it that Trimble may create) and for SketchUp users, but Google’s move obviously removes a major incentive for users to generate 3D building models – at least where the new coverage will be available. These new models will be first rolled out to Google Earth mobile and later to the desktop versions. Earliest arrival date has been mentioned as “later this summer”. In cities/areas where the new 3D content will be available, existing geo-models will not be shown in Google Earth. Building Maker will remain available but more for SketchUp users than Google Earth modelers. This is likely because the underlying data for Building Maker will be used to autogenerate the new models. 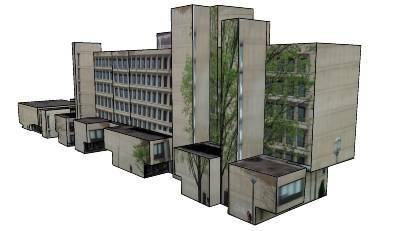 SketchUp 3D building models will still be needed for areas where the new technology is not available to autogenerate models. It is also interesting to note that along with this announcement, Google implemented the possibility to 1) download all of your 3D Warehouse models at once and b) delete your 3D Warehouse account, if you would like to do that. SketchUp Free and Pro licenses transfer to Trimble on the closing date of the sale. Geo-located models in the 3D Warehouse that were submitted before that date remain property of Google and will be licensed for use by Trimble – and therefore stay available in SketchUp. Any non-geo-located content will be transferred to Trimble. Any content submitted after the closing date will belong to Trimble and may be licensed back to Google, where appropriate. All of this likely came into being on June 1st – no firm date has been announced yet, though. The new autogenerated building model content will only be available in major cities and urban areas where Google will be able to justify the cost of a flyover. First cities to roll out are likely going to be the ones listed for Building Maker because the flyover data is already available for them. You can find the current list here. In all other areas there is still a need for hand-generated 3D building models. It would be useful if Google published a population cutoff below which there likely won’t be any flyover data available in the future. SketchUp will have access to the existing 3D Warehouse geo-located building models. It remains to be seen if it will also be able to access the autogenerated content (which would be very useful for any modeling in an urban context). Hopefully Google will be able to license that data to Trimble in the future. It would be a good move for Google to include a “Geo-modeled buildings” along the new “3D Buildings” layer in Google Earth. This layer could feature user-generated content and even combine it with auto-generated content (based on bounding-box clipping). It would also honor the work done by the many geo-modelers by giving them more visibility. This entry was posted in 3D Tech, Artists, Augmented Reality, Pre-viz, SketchUp, Tools and tagged 3D Cities, 3D content, 3D Warehouse, 45 degree ariel imagery, Building Maker, flyover data, Geo Content, Geo Modeling, Google, obliaue photogrammetry, oblique photography, photogrammetry, Sketchup, SketchUp sale to Trimble, TRIMBLE, User Generated Content. Bookmark the permalink.